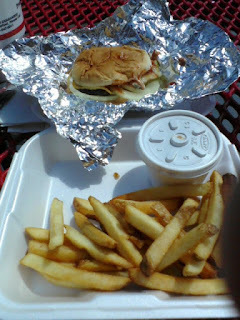 For lunch, Shannon and I drove over to Cook-Out, on High Point road after class today. I of course wanted Five Guys, but being money is a bit tight we decided to go the lesser expensive route and go to Cook-Out. I suppose such a statement is a fitting declaration of what Cook-Out is all about: cheap food. 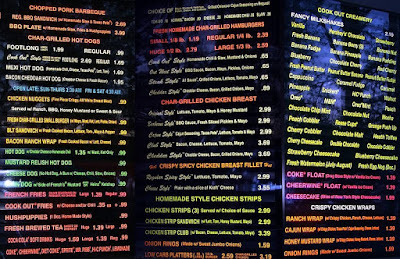 What's more, is that growing up in North Carolina I loved Cook-Out, still do, and oddly enough it was this very blog that enticed Mr Reaves to abandon his word of mouth campaign and join the digital age with Cook-Out's new website. The problem is, while I'm re-visiting this topic, I must be honest- the concept of the restaurant, and some of the food is outdated. 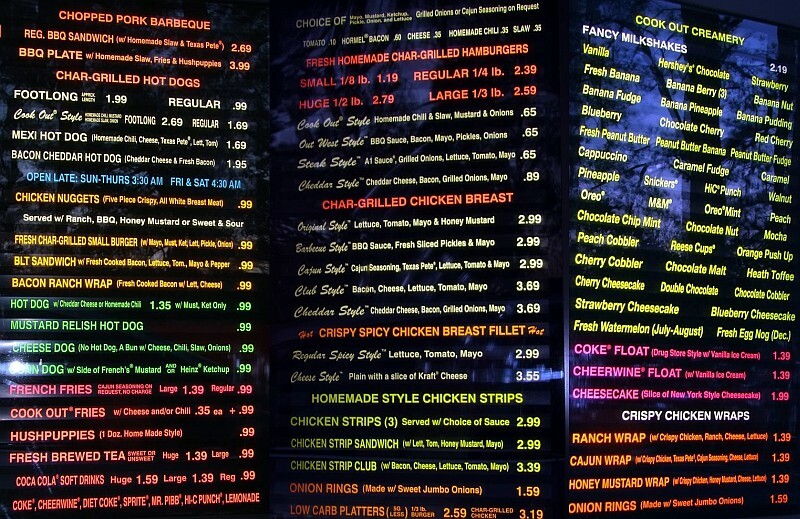 Cook-Out still has a menu of deliciousness, but it hasn't changed in more than twenty years. Even McDonald's has adapted their menu as tastes have changed, but Cook-Out? They're still serving the same food I ate in High School. Worse yet is I'm not sure they're really cooking it "Outdoors Style" any more. The website seems to indicate it's all about fresh now. Sound familiar? "Eat Fresh?" Sounds a bit too Subwayish to me. Fire your marketing team Cook-Out because, I'd be glad to sell you "Menu of Deliciousness", for a semester's worth of lunches. If you don't know what Cook-Out is then you're probably reading this from outside of North Carolina. 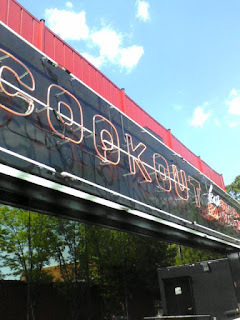 Cook-Out is a chain of privately held restaurants that originated with a double drive-thru design back in 1989. Food at Cook-Out is served in containers, or wrappers often containing hidden patriotic (American) or religious (Judeo-Christian) messages. Cups: John 3:16 "God Bless America." 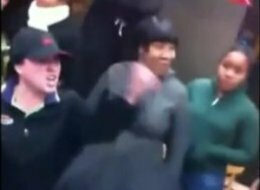 One dark and stormy night, at a local Wendy's restaurant in Greensboro, there was a young and perhaps arrogant young man named Jeremy Reaves who, while flipping burgers, found himself in an argument with his supervisor. During the course of the argument, the manager glibly asked the adolescent blue-collar worker in response to his disrespectful nature, "If the you think you can make a better burger why don't you go open up your own restaurant?" In anger, the Burgereur, threw off his uniform, declared "I will", and promptly walked out. In the days that followed, a small drive-thru on Randleman Road was purchased, and the phenomenon called Cook-Out was born, or so says the legend. Cook-Out became famous because of their burgers are "Cooked Outdoors Style", yet they're not cooked outdoors. In fact that slogan has quietly disappeared from their newer buildings. 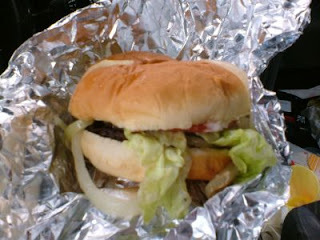 Eating today, it's hard to taste the grilled aspect of the sandwich. Perhaps their business model has changed? In fact, now it seems to be all about fresh. Cook-out, I'm told by employees I've interviewed, pride themselves on freshness. The wide-ground beef is never frozen, ground within 24 hours of being sold, and resembles your typical supermarket style hamburger meat. In all honesty, this is what a hamburger would look like if you made it at home. (Though oddly doesn't taste as fresh as Johnson's in Siler City) So why go to Cook-Out? That answer is simple. Most people can't cook. I cook a lot, but char-grilling a hamburger? Well that's likely to come out burnt on the outside and pink in the middle. If I'm totally honest, all hamburgers should be medium-rare, but I digress. So this is what Cook-Out has always done right, and what still makes the place, shall we say, awesome? A "Huge" Steak Style, dripping with A-1 and grilled onions for only $2.99 is a bargain. I can't even get a gallon of gas for that. The Cookout Plate with a side of chili. Part of what makes Cook-Out's burger (and milkshake menu), "cool", is the absurdity factor. Where else can you get a barbecue bacon cheese burger (Out West Style), a chili-cheese fry, and a snickers milkshake? It's just plain odd, and odd is good. But there are some things about Cook-Out that have become dated, eclipsed by the newer burger shops, that Cook-Out, doesn't offer. While I will say their fries are good, and I did grow up with the "four person chili fry boat", Cook-Out's chili, while typical for the region, is less than innovative and lacking the zest our American palettes have grown to love. Cook-Out lacks a flag-ship sandwich, the fundamental, and quintessential chili burger. Yes, I know they sell a chili-burger, but compared to the competition, major chains in the U.S. that sell them, good ones in my opinion, their chili lacks the refinement of a Tommy's, a Pink's or even a Johnson's. I also think there's a perfect opportunity for innovation. 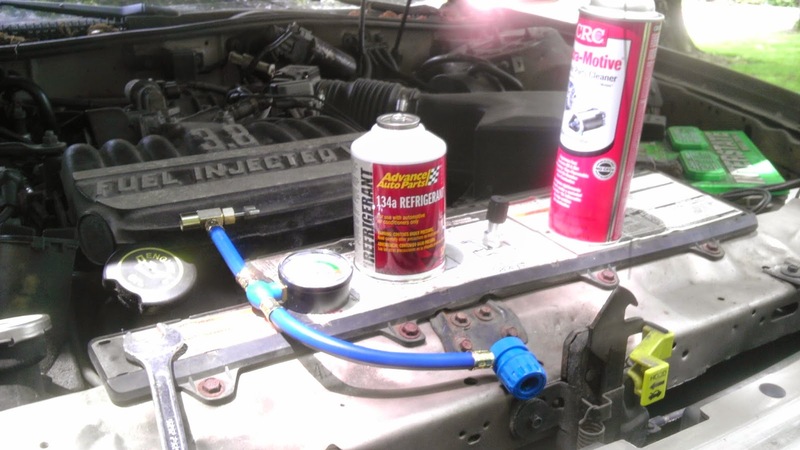 First, they need to get some vinegar packets. French fries and vinegar have become a staple in the U.S., but why not go wild, and bring Belgian fritessaus (a mayonnaise like fry dip) to the menu? It's a perfect match, similar to the many flavors of milkshakes and hamburger combinations Cook-Out provides, why not offer various sauces, or dips? It's all about the condiments these days anyway. On the meat, consider adding a hickory smoke flavoring. Today, barbecuing is all about the designer flavors of charcoal. If you're not actually grilling the burgers, add the flavoring. Don't abandon, "Cooked Outdoors", embrace it. The menu of deliciousness is calling you Cook-Out. And till then, I'll occasionally drop by after class, order a very inexpensive, yet wonderful Steak Style cheeseburger, and reminisce about the days when Cook-Out was the only place in town who served a good burger. Back when Greensboro seemed like the world, and gas to get there was cheaper than the food I ordered. Cookout Hours are typically open around 11 a.m. and closes between 3 and 4 a.m at most locations.